Early start. This morning we are exploring Deception Island, an island that rises 1600 feet from the seabed with a submerged diameter of approx. 15 miles. 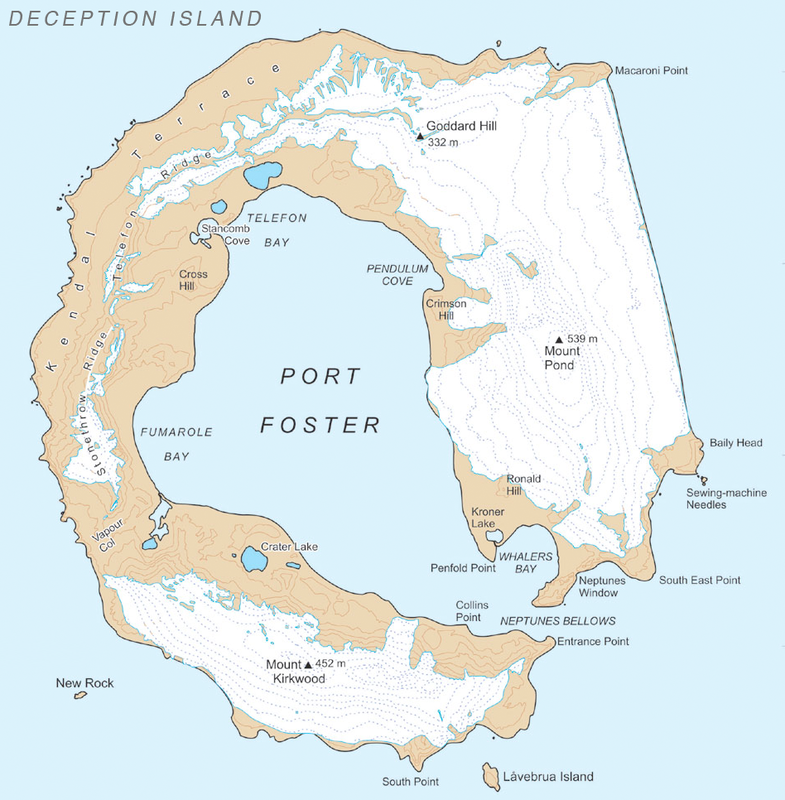 The island forms a caldera in the centre that is about 6 miles in diameter with a depth of 585 feet. Around this caldera volcanic pumice stone slopes rise up with several smaller crates dotted around the islands. It presents a very desolate lunar type picture but is spectacular viewing. The entrance into Deception Island is through a narrow gap in one of the crater walls. 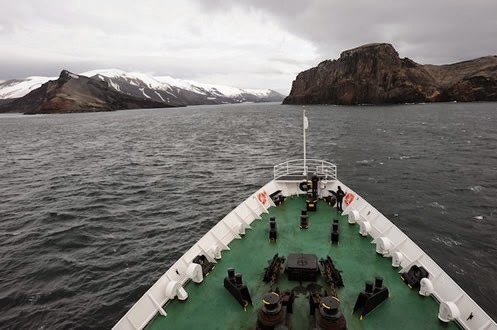 This entrance is approximately 200 feet wide but with a submerged rock about 2 metres below the surface the ship needs to navigate through a very narrow gap to access the caldera where we will do our landings. For that reason the bridge is closed to access as the crew carry out this delicate navigation. The entry is scheduled for 7am as is a great sight to see as the ship slide through the entrance just several feet from the high wall on the starboard side of the entrance. There is evidence of some volcanic activity also with steam or gases leaking out through cracks into the air. Once inside the caldera we travel to the northern end to a location called Telefon Bay, named after a whaler ship that was stranded there back in the late 19th century. En-route we pass Whalers Bay where the ruins of an old whaling stations are located. You can make out the old rusting whale oil rendering tanks as well as several of the housing buildings. The shore line is littered with the skeletons of whales that would have been processed here during the height of whale hunting in the late 19th and early 20th century. To the south of the island there are two research stations built, one belonging to Spain, the other to Argentina. Our plan is to land at Telefon Bay and hike to the top of one of the slopes to view some of the other craters. We then make our way up to a black glacier so called as a result of a combination of volcanic ash and ice that gives it a black appearance. Looping back we climb to another viewing point and then back down across the volcanic tundra towards the shore to head back to the ship. As well as getting the opportunity to take in some of this amazing ancient landscape it's a great opportunity for stretching the legs! Back on board we immediately relocate for the next landing…we are making our way to Pendulum Cove where believe it or not some people are opting to take a dip! Zodiacs launched people start heading for shore. As we approach it is a hilarious sight with people stripped down out of all the weather proof gear to swim suits. Some people are running full speed into the water amid screams of shock as the cold water hits them, others are being more reserved and doing the little by little approach! "uhh ahh uhh aaaaaaaahhhhh", well you get the picture. Soon The Shackleton 100 gang are on the beach and before long Jane, Geraldine, Jukka, Vincent, Flora, Donal and Rob (our adopted Aussie Irishman) are all in the freezing waters, tick that off the list! Polar Plunge completed! Well done all…I had to take the photos and video…otherwise I'd love to have been in there…no really! Back on board and next on the agenda is a visit to Hannah Point and Walker Bay located further north again at Livingston Island. It's named after a sealing vessel Hannah of Liverpool which was wrecked on the site in 1820. Our landing site is a small, steep faced beach about 50 metres wide which is home to Chinstrap and Gentoo penguins, blue eyed shag, snowy sheathbill, kelp gull, pintado petrel and southern giant petrel. As we approach shore we notice movement on the beach and realise that there are elephant seals landed. These are juvenile males but still huge beats all lying side by side on the beach. Of all the seal species these elephant seals are known to be the deepest divers, predating squid up to depths of 4 kms! Now that's a breath hold! starting the mature. In the sky around us kelp gulls and giant petrels effortlessly wheel and glide on the updrafts created by the gentle breeze that sweeps in across the water and up the steep walls. Back along the beach and further inland there are deposits of fossils left by surveying geologists that are given close examination by most. Some of the passengers are geologists and we get some good insights into what we are looking at! On the way back to the zodiacs we come across several fur seals too. These would have been hunted to near extinction in the past but now thankfully populations are on the increase. So it's back to the ship with a gang of happy and hungry adventurers! Another great day in Paradise!